There’s no denying it, we love cookies (myself included)! Stats from DailyMail show that the average American eats 18,928 cookies in their adult lifetime. To reiterate, that does not included cookies eaten before the age of 18! Cookies are a yummy treat year-round but at certain times of the year, they just seem like a must-have. For example, what would Christmas be without cookies, am I right? If you’re looking to put a chunk in that 18,928 cookie quota this holiday season, I highly recommend this Oreo ornament cookies recipe! 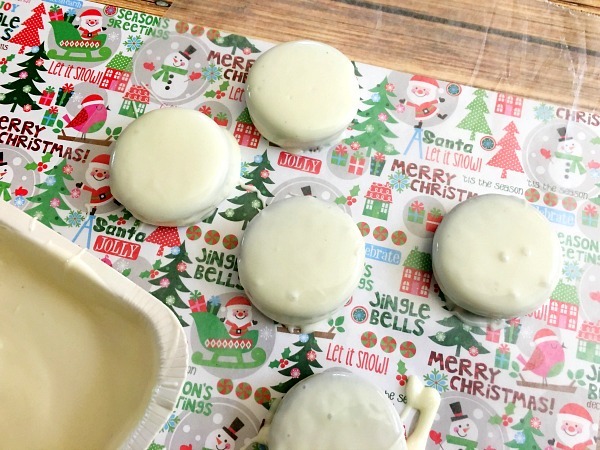 This ornament cookies recipe is sure to impress your friends, family, and even Santa himself! 🙂 First off (and most importantly, in my opinion), this ornament cookies recipe is delicious. I mean, come on, Oreos covered in white chocolate? Yum! A chocolatey delight like this would cost you a couple of dollars (yes, per cookie) at Godiva but you can make this ornament cookies recipe much cheaper at home. 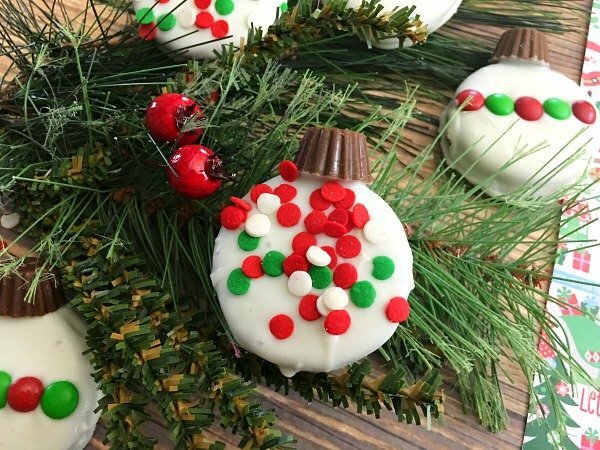 In addition to being scrumptious, this ornament cookies recipe is pretty. Yep, it’s a treat for your taste buds and your eyes. As the name implies, the finished product looks like an adorable Christmas tree ornament. Even if you’re pretty inept in the kitchen, the finished product from this ornament cookies recipe will come out looking like something from a boutique bakery. Which brings me to the third “selling point”, if you will, of this ornament cookies recipe: The little ones can help out. If you aren’t dead-set on having a perfect finished product, the kids can definitely get involved with decorating the ornament cookies. Personally, I’d recommend keeping little fingers away from the melted chocolate as you’re just asking for a mess and burned limbs, but once the cookies are dipped there’s no reason the kiddos can’t add the sprinkles and mini M&Ms. 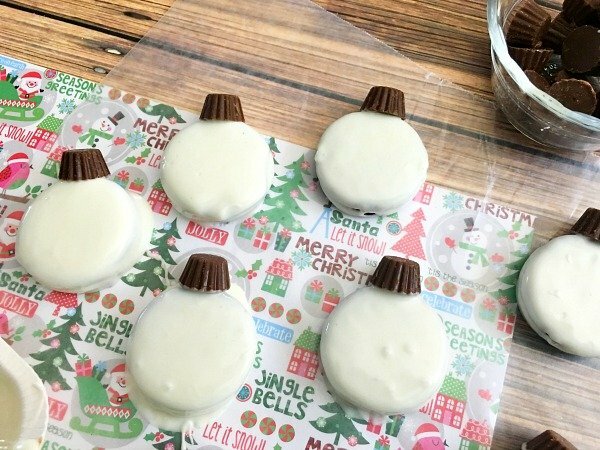 Regardless of whether or not you have “help” with this ornament cookies recipe, it’s pretty quick and easy. As you may have guessed from the name, this ornament cookies recipe starts with an Oreo so you don’t have to do a lot of baking from scratch. 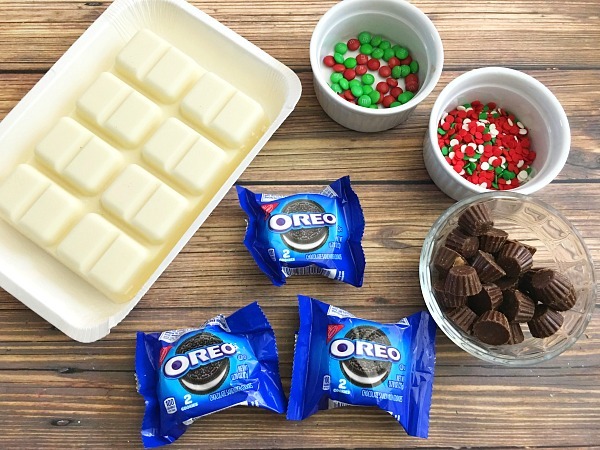 You’ll start with a store-bought Oreo (or generic knockoff) and dress it up for a tasty Christmas treat. Typically, I love making things from scratch as much as possible (or I at least like the idea of it, if you know what I mean) but around the holidays there’s so much to do that semi-homemade recipes, like this ornament cookies recipe, are a lifesaver. Tip: You can totally customize this ornament cookies recipe by swapping out the type of Oreo you’re using. Of course, you can go with the classic Oreo but the next time you’re in the cookie aisle, take a look at all the varieties available. 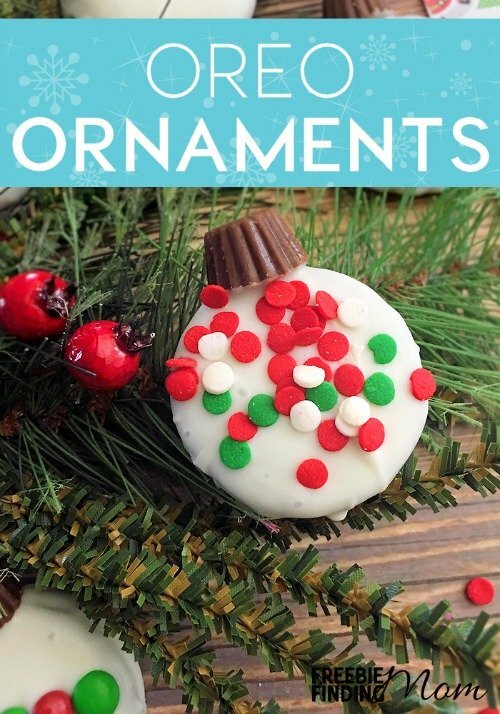 Consider making this ornament cookie recipe with a few different types such as golden, chocolate creme, and mint creme. 1. Following the directions on the packaging, melt the almond bark in the microwave. 2. Place a few Oreos in the melted chocolate. Flip them over to ensure both sides are coated. Tip: Use a spoon to keep your fingers clean! 3. Use a fork or chocolate dipping spoon to lift Oreos out of the chocolate. Place Oreos on a piece of parchment paper. 4. Place a Reese’s mini upside down on the top of each chocolate-covered Oreo. 5. 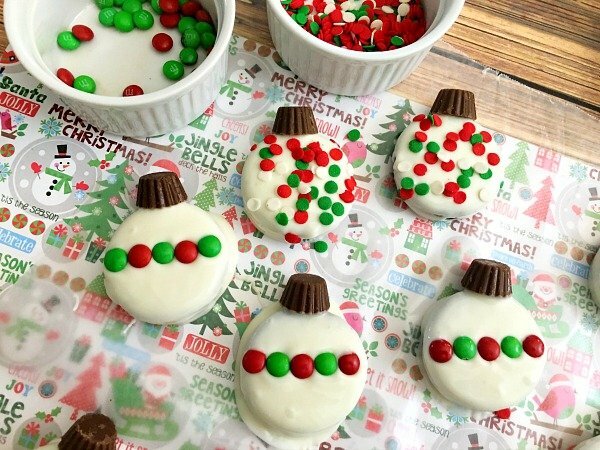 Decorate half of your Oreos with Christmas sprinkles and the other half with your red and green miniature M&M’s. 6. Let the almond bark harden for about 15 minutes and transfer to a serving platter. Kelli–SERIOUSLY!!! So adorable! I am so making these with my kids!